…Le jour de gloire est arrivé! I have strong connections to our neighbours over the other side of the English Channel and I’m not just talking about my love for Steak Frites! I spent every Summer, the entire 6 week school holidays practicing my rubbish French and playing with the local kids not too far from La Rochelle. My parents still visit for a few months every Summer and still try to drag me over there for family holidays fifteen years later! It’s been a good few years since I visited for longer than a day trip, I think the overkill when I was a child/teenager may have put me off a little but the country will always hold a special place in my heart. So, in honour of Bastille day and the fact that ordinarily (were it not ‘weigh in day’) I would be stuffing my face with Brioche and Pain au Raisin to mark the occasion, I’m gonna pay tribute to some awesome and lesser-known French brands that you ought to know more about! 1. Darphin – Hailing from Paris, Darphin is a professional, botanical skincare line that takes a more holistic approach. Priding itself on its aromatic, plant-based formulas, the latest addition to the line: Melaperfect* is an Anti-Dark Spot Perfecting Treatment designed for skin with hyper pigmentation. 2. Rouge Baiser – This French drugstore brand is best known for creating the first ‘kiss-proof’ lipstick in 1927. I own #405 L’Authentique… isn’t the packaging to die for? 3. Nuxe – Born out of a small laboratory in Paris, Nuxe is now one of the best-selling brands in pharmacies today. Another brand firmly based in natural origins, their dry oils have a global fan-base. 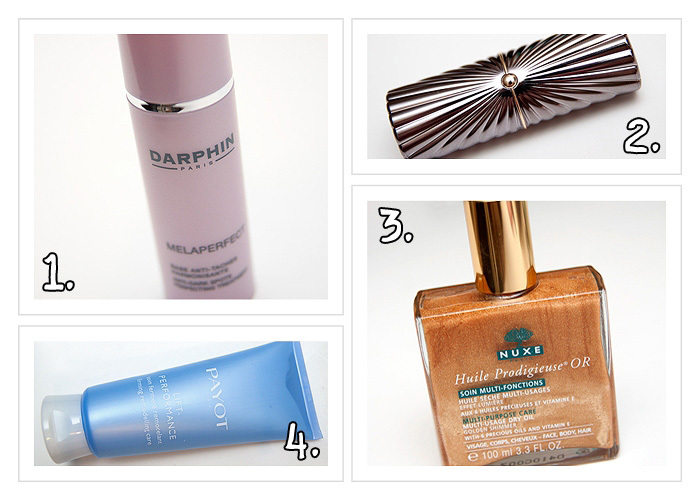 Apply a few spritzes to your skin, face, hair… anything that could do with a gentle golden shimmer! The Huile Prodigieuse Or* is an iconic holiday essential. 4. Payot – Created in 1927, this Parisian (I’m sensing a theme) Spa brand offers a huge range of products and spa treatments. The philosophy of the brand is also heavily invested in massage techniques and facial exercises, practically pioneering beauty rituals that are still used in spas today. The Payot Lift-Performance Firming Remodelling Care has been put to work on my (many) wobbly bits in the hope of some remodelling of my own! 5. Caudalie – Born from French vineyards, the philosophy behind the brand is based in the anti-oxidant properties of the grape and the grapevine polyphenols. The Caudalie Beauty Elixir promises to tighten pores and provides an instant burst of radiance to the skin. I’m a long-term fan of the Grape Water spritz as an alternative to my Avene in hot weather so I’m looking forward to seeing if I can achieve any ooh la la miracles with the power of wine grape. 6. T. LeClerc – The T. LeClerc line is steeped in heritage and prestige, best known for the iconic T. LeClerc powders in various correcting shades. One day, I will get my hands on Banane but as things stand, I will make do with my blush and lipstick in all their beautifully packaged glory! 7. Bioderma – You can’t enter a French pharmacie without being greeted by the same staple lines: Avene, Vichy, Bioderma, La Roche Posay and Biotherm to name just a few. Of course most people know about the Bioderma Crealine H2O by now but the brand make some other lovely products too! Bioderma Sebium Foaming Gel is a gently foaming wash for combination skin that doesn’t strip my face of moisture. I’m getting my Pharmacie dealer (a.k.a Mum) to bring me back some more Pharmacie goodies this Autumn! 8. Parfums D’Empire – My most expensive perfume purchase to date is Ambre Russe from Parisian fragrance house, Parfums D’Empire. The most decadent combination of rum (though I think I’m supposed to smell vodka), amber, leather, tobacco and tea that catapults you straight into the grand corridors of an imperial Russian palace of yesteryear. It’s completely over the top and a love it or hate it scent. Can you tell I love it? Love. It. Next on my list is Cuir Ottoman… just as delightful. What are your favourite French brands in honour of Bastille Day? Aux aaaaaaaaaaaaarmes citoyens! Formez vos bataillons! That lipstick packaging is just amazing! 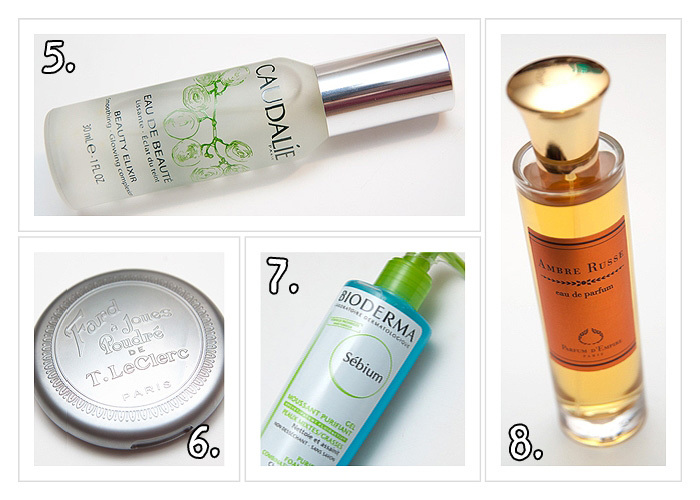 My favorite is Caudalie, hands down. I can’t really think of many off the top of my head, though! Of course, being in Belgium, and crossing the border quite often to get my fix of French products at the cheapest price (they go up a few € here), I do like a lot of French products. I do like Nuxe a lot, particularly the Huile Prodigieuse (regular one) and the Rêve de Miel range. But what I love the most are the skincare products: Avene, La Roche Posay, Bioderma, Uriage, SVR, Klorane… so many brands that are super high quality, cheap, and easy to find in every pharmacy! I love Caudalie lip conditioner, it’s fab! Ooh, I love the packaging on that lipstick (and the sound of that perfume, my god)! Phyto! I stock up on holidays on their shampoos! I was in a boutique’s store closing sale the other day and I saw that their entire T. LeClerc display was 60% off. I was SO EXCITED until I realized only the medium and dark shades were left. DANGIT. Also, I’m so glad you’re loving Ambre Russe. Here’s to smuggling!